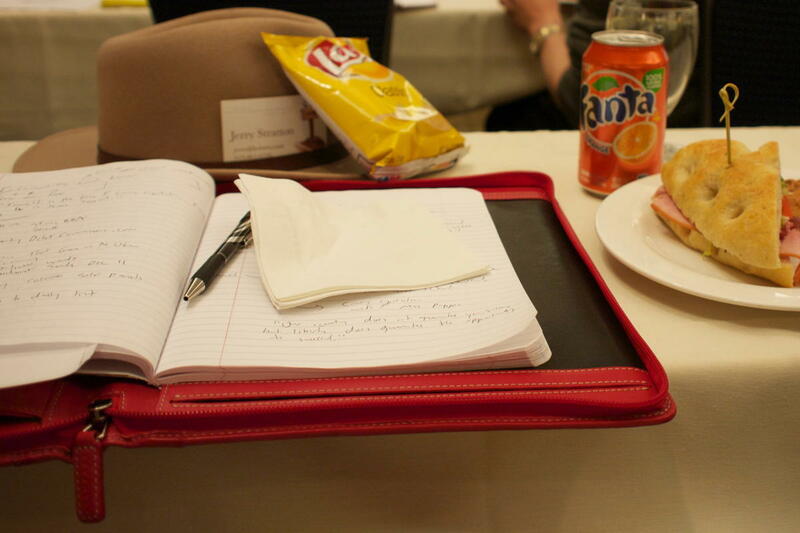 A composition notebook fits perfectly; the Ambi was a great companion at the Colorado BlogCon in 2011. This may have been the first serious use I put it to. Sometime in 2010 I started thinking seriously about getting a good folio. I was tired of making do with cheap pieces of junk that cracked, didn’t work well with my writing tools, and that seemed to be designed more for kids than for writers. I wanted something that could handle an iPad without the iPad sliding out, keep loose papers together, and hold a notepad for writing by hand—preferably a classic marble-cover composition book. I also wanted it to hold at least one pen. Preferably two, because at the time I had not yet found the Space Pen. And, at the same time, I needed it to be relatively compact and easy to carry around—the whole point of a folio is to be able to take it to the park or a bar or the library, somewhere to write. It took several months, but I finally settled on the Levenger Ambi, waited for a good sale, and ordered it in November 2011. It’s exactly what I was looking for. The overall folio zippers shut, so that anything inside, such as an iPad or loose papers, does not fall out. It has space for two pens, one on the top and one on the bottom of the left side1 . It has three different-sized pockets on the left. One works great for cards, one for large tickets or receipts, and one for full-sized writing paper. It has a space to slide in the back cover of a notebook, so that I can slide composition books into it horizontally. It also can take writing pads that slide in vertically, if you prefer. I haven’t used one since I finished up the one that came with the folio. 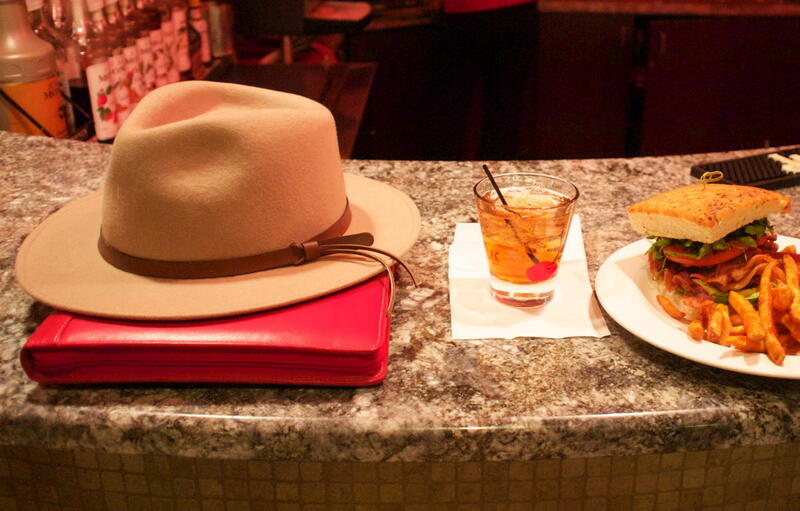 The folio seems to have been designed to rest under a fedora. And it has a zippered compartment for especially important things such as a passport or checkbook. I rarely carry such things in my folio, but when I do, the inner zipper ensures they don’t fall out when I unfold the folio. More often, the zippered compartment carries extra camera cards, adapters for the iPad for reading camera cards, and rulers or even a bit of extra cash. I’ve used this folio nearly nonstop since buying it in five years ago. That’s about four years longer than any other folio has lasted, and it still looks new. Besides using it for writing, I also use it for trips, placing maps and reservations inside in the order that I’ll need them. As seems often to happen, I’ve waited long enough to review it that may have been either discontinued or replaced. There appear to still be some on Amazon, but the Levenger website no longer lists it. They may have replaced it with the Bomber Jacket Ambi-Flex Folio, but that takes their own Circa notebooks instead of a generic notebook. For me, that wouldn’t work; I want to be able to use whatever notebook I happen to feel like using for my current project, and also to remove it when I want to carry just the notebook and not the folio. But if you can find the original, I recommend taking a look at it. I’ve found it extraordinarily useful. The “ambi” stands for “ambidextrous”. So if you’re left-handed, this would be the top and bottom of the right side. The Levenger Ambi folio easily holds a lot of letter-sized paper, a common notepad, and varying-sized papers. It also easily holds a tablet such as an iPad. I find these marble cover-style composition books to be the perfect compromise between size and ease-of-carry for taking extensive notes. It should also fit in any good folio. The Levenger Ambi Folio last modified November 15th, 2016.